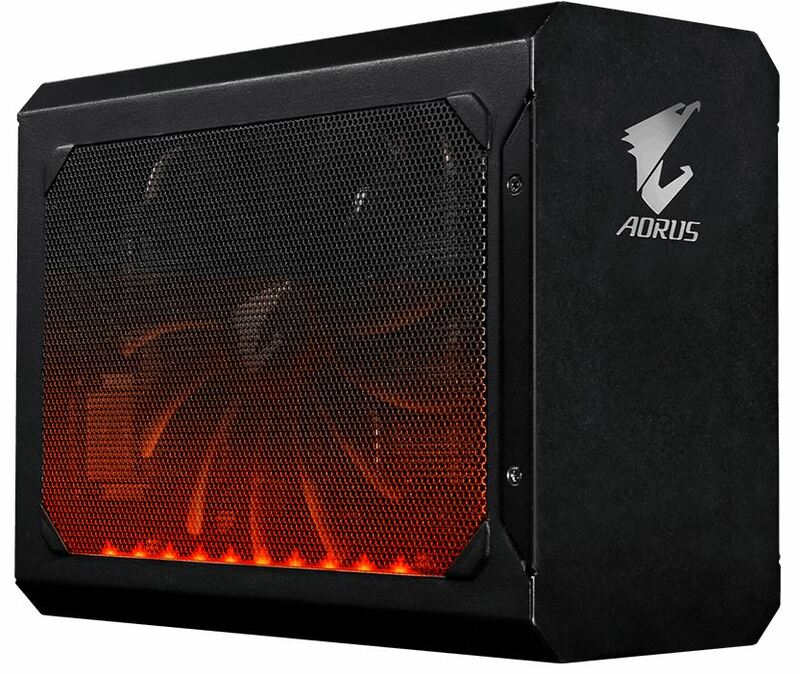 Following on the heels of the AORUS GTX 1070 Gaming box, a eGFX solution for laptops and ultrabooks, GIGABYTE and the AORUS brand take performance to a higher level by installing a more powerful graphics card inside the same chassis. Instead of a GTX 1070, a fully appointed GTX 1080 finds its way into the diminutive Gaming Box offering users another option for higher performance out of their eGFX solution. The 212 x 96 x 162mm (8.34” x 3.77” x 6.37”) Gaming Box is small enough to sit on the desk or even to carry with its included carrying case. 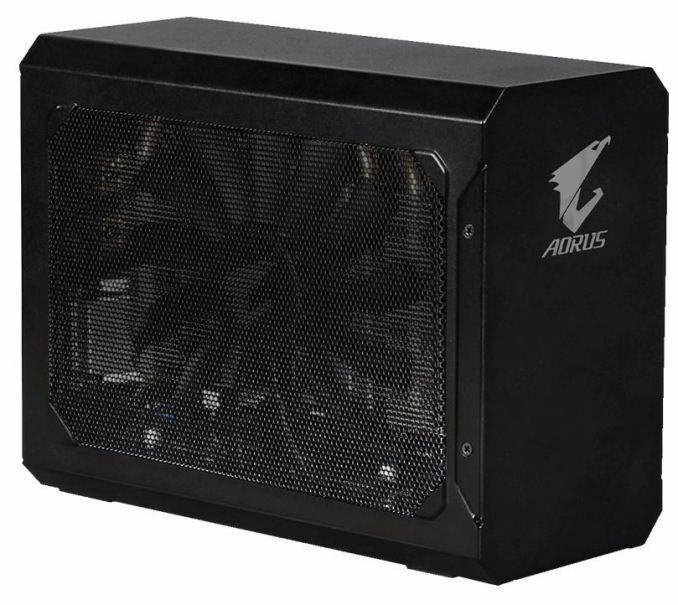 Its footprint is notably smaller than the ASUS ROG XG Station measuring 312 x 170 x 44mm and most other competitors. 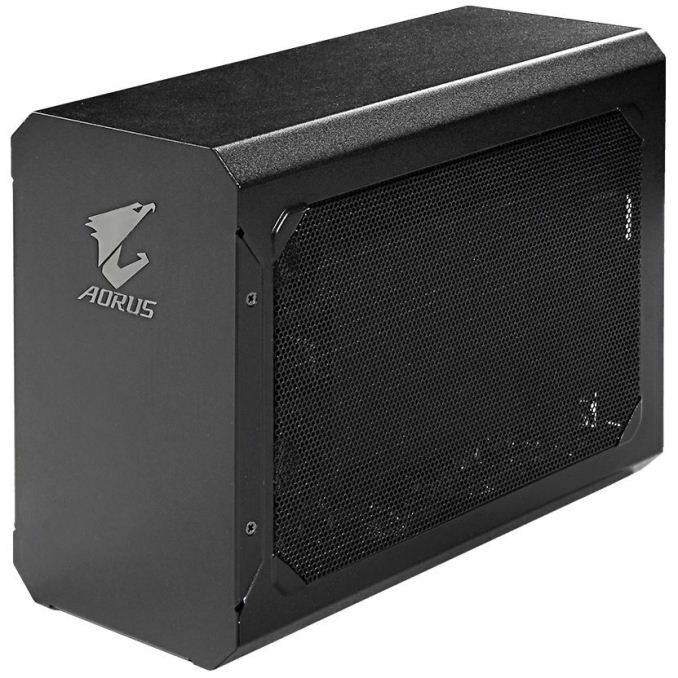 As far as looks, the all black aluminum case displays the AORUS Falcon proudly flexing its wing on the front panel. Both sides of the chassis are covered with mesh allowing for airflow inside the case. Active cooling is provided by a large 130mm fan on the left side taking air in and feeding it directly to the video card inside. The 1080 Gaming box also integrates RGB LEDs at the bottom of the fan side which can be controlled by GIGABYTE’s RGB Fusion software. The Thunderbolt 3 connected eGFX device allows for plug-and-play attachment (no reboot necessary) to your laptop or ultrabook providing users a significant graphics boost when compared with the integrated graphics solution found on most portable devices. Powering the enthusiast class GTX 1080 is an included a 450W, 80 Plus Gold certified power supply. The 1080 inside is clocked at 1607/1733 MHz Base/Boost in Gaming mode and 1632/1771 MHz in OC Mode. The 8GB GDDR5X comes in at 10010 Mhz. 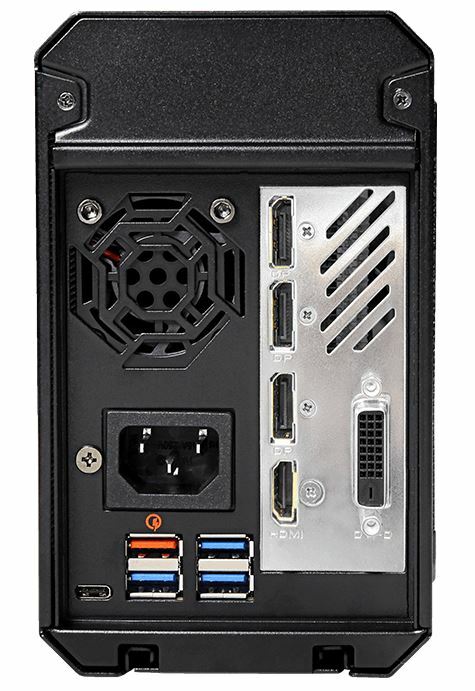 Around the back of the device, we find a standard fare of video outputs consisting of DisplayPort, HDMI, and a DL-DVI can connect up to four external monitors simultaneously. Outside of improving graphics performance, the Gaming Box also serves as a complete docking station. It is able to charge the connected laptop with a maximum output of 100W while still powering the GTX 1080. Additionally, there are three USB 3.0 ports for connecting peripherals or external storage. There is also a quick charge USB 3.0 port that allows for personal mobile device charging at, “…up to 4 times the speed of a conventional charger.”, according to Gigabyte. 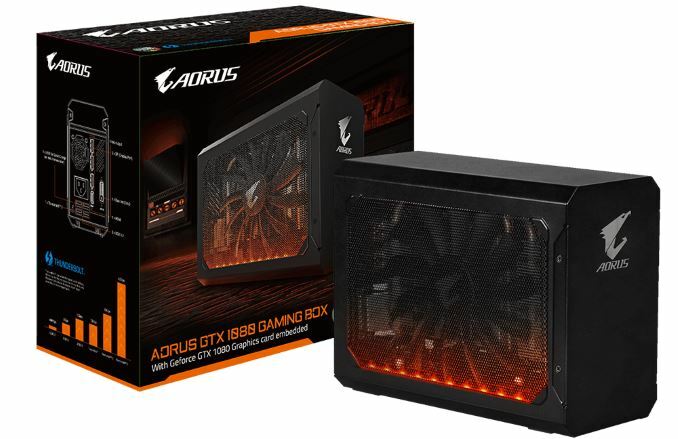 Pricing nor availability for the AORUS GTX 1080 Gaming Box were released by Gigabyte. The 1070 Gaming Box can currently be found on Newegg for $590, so our expectation is the 1080 Gaming box will be around $750. Why stop at a 1080? If you're paying $250ish for this box, you might as well get as much performance as possible. It's not like that 450W PSU will be your bottleneck. Haha. The bandwidth starts to be the bottleneck. I think you should stop speaking for others, the 1070 gaming box clearly sold enough for them to produce this 1080 version.